If you have been involved in an accident while driving under the influence, you are facing serious legal consequences. DUI is a wobbler offense in California, meaning that prosecutors have discretion to charge you with a misdemeanor or a felony offense depending on the circumstances of your case. Under California Vehicle Code 23152, it is illegal for a person to (a) drive under the influence of alcohol or (b) drive with a BAC of .08 percent or more. However, you face even more serious consequences if you are involved in a DUI accident resulting in injury or death. Under California Vehicle Code 23153, you can be charged with DUI causing bodily injury if you cause another person to be injured while driving under the influence. According to California Penal Code 191.5, you may be charged with vehicular manslaughter while intoxicated if you cause the death of another person while driving under the influence. Penalties for this crime vary depending on whether you acted with gross or ordinary negligence. Vehicular manslaughter while intoxicated caused by gross negligence (you acted with malicious intent) is a felony in California. Vehicular manslaughter caused by ordinary negligence is a misdemeanor in California. You may be charged with second-degree Watson murder under California Penal Code 187 if you maliciously and intentionally cause the death of another while driving under the influence. In California, your license will be automatically suspended if you are arrested for DUI. However, your license will be suspended for a longer period of time if you are involved in a DUI accident. If you are convicted of misdemeanor DUI causing injury or death, your license will be suspended for a minimum of one year. If convicted of felony DUI or vehicular manslaughter while intoxicated, you will lose your license for a minimum of three years. The court, at its discretion, may increase your suspension period under certain circumstances. In addition to the criminal penalties you face after a DUI accident, the DMV also has a separate administrative case against your driving privileges. Because there is no presumption of innocence in your DMV case, you face license suspension even if you are not convicted in criminal court. You did not act negligently (neither ordinarily nor grossly) at the time of the incident. 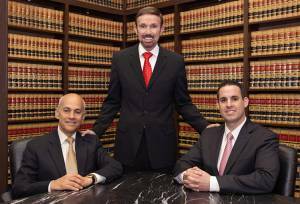 With over 30 years of experience, our DUI accident attorneys at Wallin & Klarich are able and ready to take on your case. If you or a loved one has been arrested for DUI causing injury or death in California, you need to contact an experienced California DUI attorney immediately. At Wallin & Klarich, our skilled DUI attorneys have been successfully defending clients facing these charges for over 30 years. We will meet with you immediately to review the facts of your case, and plan a defense strategy that will help you get the very best outcome possible.